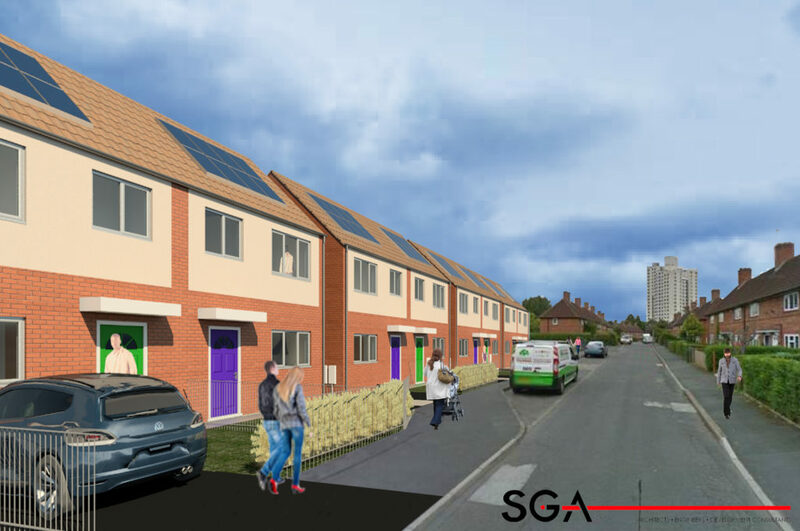 Nottingham City Council and Nottingham City Homes (NCH) are continuing with the biggest council homes building programme for a generation with the development at Windmill Close in Sneinton, Nottingham. Work starts on the site on Monday 29 April 2013 so local residents took the chance to find out what would be happening by attending an Information Event on Friday 19 April at the famous windmill on Sneinton Hill. 150 residents were sent invitations from Nottingham City Homes to attend and many took up the offer. Residents were given information about what was going to be built, when work would be starting and finishing, and got the chance to talk directly to the building contractors, Robert Woodhead Ltd and also representatives from Nottingham City Homes. There will be 12 three-bedroom semi-detached family homes built on the Windmill Close site; a former green field site. Each home will incorporate 2Kw solar panel systems to help reduce electricity bills. These are clearly shown on the street render provided by architects, SGA. The homes will also be constructed to Code for Sustainable Homes Level 4 with a fabric first approach being adopted. The Code for Sustainable Homes Assessment will be conducted by Woodhead Living’s In House Code Assessor which will deliver time and cost savings to the client, Nottingham City Homes. The site has also been registered to the Considerate Construction Scheme and Robert Woodhead has set a target of 35/50 under current scoring guidelines, which if achieved, will demonstrate performance beyond the national average. The footpaths that run alongside the Windmill Close site will be closed for Health & Safety purposes and diversion routes will be in place for local residents. The aim is to have the homes completed and ready for residents by 10 March 2014. This is Robert Woodhead’s fourth project for Nottingham City Homes in recent months and was won through the Efficiency East Midlands New Build Developer Framework led by Nottingham City Homes.